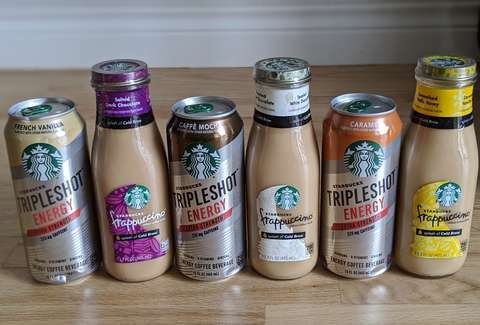 Not content to simply have a mini-Starbucks at the entrance of the grocery store, the coffee mega-chain is now turning the cold drinks aisle into its personal mini-'Bucks with the release of six new Triple Shot energy drinks and bottled Frappuccinos. Basically, the grocery store is now a Russian doll of Starbuckses. But which of the new bottled and canned goods are worth skipping the barista for? We downed them all to find out. 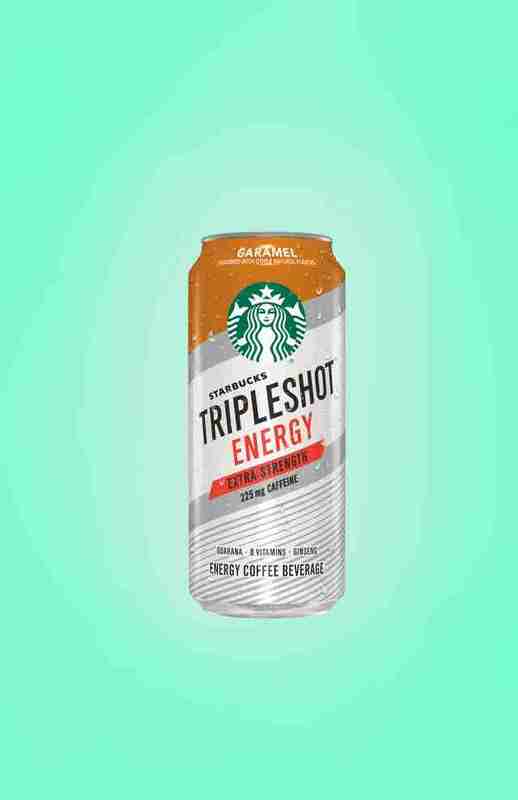 When I cracked open my first caramel-flavored Triple Shot, I expected a Red Bull-like beverage that smelled like coffee to come pouring out. This is billed as an energy drink, but let’s break down the main ingredients: it’s coffee, cream, caramel, guarana, B-vitamins, and ginseng. After a few sips, it was clear that the drink’s primary purpose was to be an energy drink that happened to taste like coffee, and not a coffee-forward beverage with a ton of caffeine. But hey, the point of this is to get you jacked up on caffeine, and it certainly delivers with 225mg of the stuff (8 ounces of coffee typically has 95mg). Remember the movie Must Love Dogs? Yeah, me neither. But if you buy this, know that you Must Love Caramel. The caramel notes are strong, though not mighty enough to cover up the energy-enhancing ingredients like ginseng. It’s cute that there’s an accent mark over the “e” in the drink’s name, which is a little bit like if Guy Fieri had a menu item at his new restaurant called Chickèn Tendèrs. That’s no knock on how it tastes, it just adds a certain level of class. That said, mocha flavors are present in the drink, but once again, it doesn’t appear to be enough to hide those pesky standard energy drink components. And that’s surprising, because you’d think with the help of mocha flavoring and 30 grams of sugar, it’d have a fighting chance. On the plus side, the aftertaste of the mocha and cream blend is quite nice. 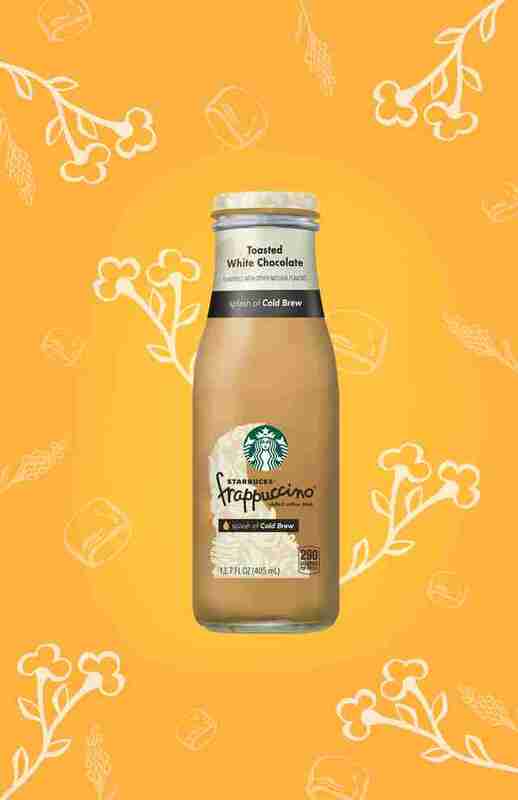 Coffee is a background note in this drink as well, so don’t come expecting a ton of java -- for that, there’s always the mighty bottled Starbucks Cold Brew. 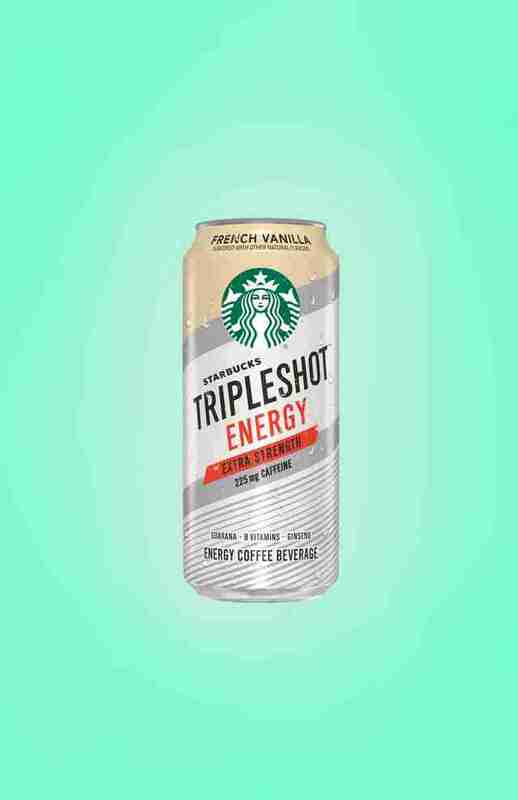 The strong French Vanilla notes in this drink help separate this from the other two new flavors with weaker flavorings -- the vanilla here takes a front seat to the energy drink ingredients. 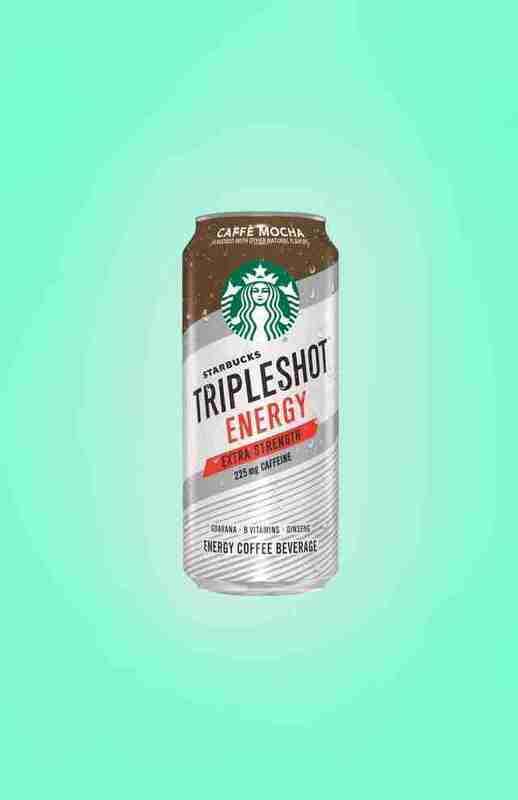 It’s also the Triple Shot drink with the most coffee flavor, which is a big win for people who love coffee but don’t want to have to drink two cups to get a serious buzz. A few sips and you’ll feel like you’re floating on a cloud made of vanilla, cream, and coffee (though if you want a more dramatic looking coffee cloud to post to Instagram, stop by your local ‘bucks to snag Ariana Grande’s favorite macchiatos). The label says a “splash of Cold Brew,” so I can only assume this Frapp was the result of an promotional campaign between Starbucks and that ‘80s Tom Hanks mermaid movie. As it turns out, all three of these Frapps have the “splash of Cold Brew,” which I’m hoping means more coffee flavor this time around. The first thing that stands out is that it smells quite a bit like the French Vanilla Triple Shot Energy drink. It provides plenty of vanilla notes as well, but some chocolate sneaks into the finish. And with a whopping 44 grams of sugar, it’s no surprise that it’s delicious. On the whole, the Frappuccino drinks are leaps and bounds creamier and richer than the Energy Drinks, which also makes sense -- this is a Frapp, that’s an energy drink. Granted, this doesn’t have a big ole plume of whipped cream on top like a real Frapp, but it has plenty of coffee, sugar, and cream to remind you of the in-store version. 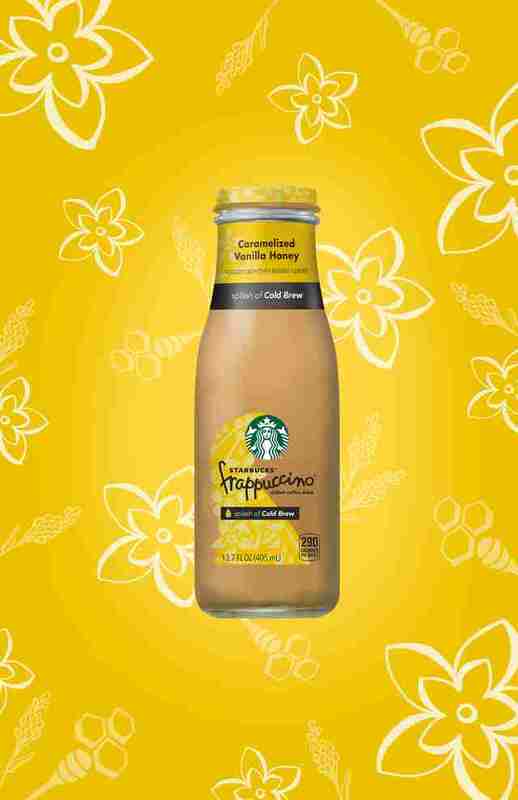 This flavor profile is similar to a discontinued Frapp that debuted in 2016 -- the Caramelized Honey Frappuccino. That drink also had vanilla in it, so we can safely assume it’s the same drink with a different name. Here’s the good news for you dessert lovers: It tastes exactly like liquified creme brulee. I don’t get much honey here, but there is plenty of vanilla and burnt sugar. If you’re buying this in the hopes it tastes like honey, I’d recommend sticking to the classic Arizona Green Tea and Honey, because that flavor mostly gets lost in the mix here. And while this is designed to be consumed cold or over ice, it does get me excited for the seasonal Caramel Brulée Latte to return over the holidays. Before I take a sip, I’m crossing my fingers that this actually has noticeable sea salt in it, and this wasn’t just named Salted Dark Chocolate as a marketing ploy. Sea salt and chocolate is one of the best flavor combinations you can treat your taste buds to, even more than Nutella and anything else that’s edible. 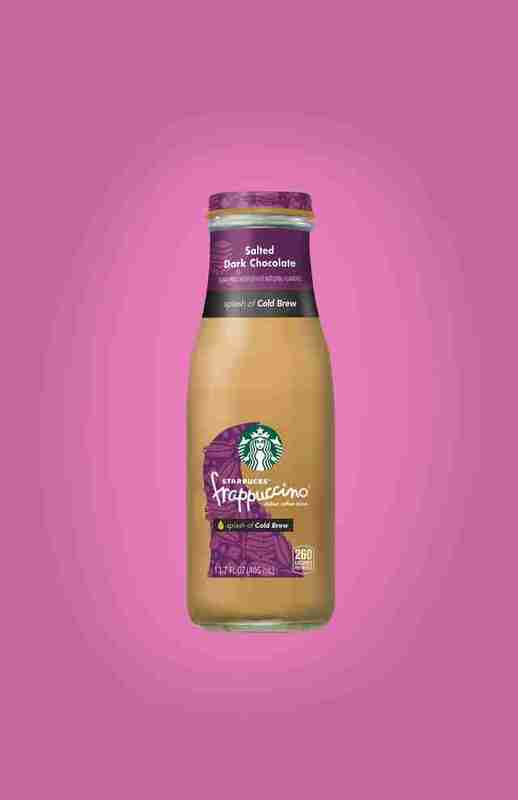 My tastebuds didn’t steer me wrong -- this bottle has about 16% (or 40mg) more salt than the other Frappuccinos. The salt thankfully doesn’t stick around for long -- the finish is all cream and chocolate. This Frapp delivers on the promise of its name. It’s like drinking one of those fancy dark chocolate bars finished with sea salt. One last thing to keep in mind, if you’re looking for a ton of coffee, it’s present, but a “splash of cold brew” is an accurate description. Tom Hanks and Daryl Hannah would likely approve.